Ambiguity on a closely watched metric in the beverage industry has raised some concern among shareholders. 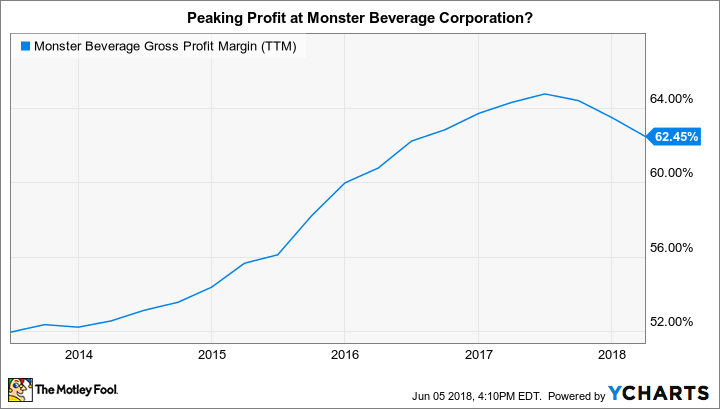 Monster Beverage (NASDAQ:MNST) shares dipped 7% last month, chiefly because the company's first-quarter 2018 results revealed a contraction in gross margin. The "MNST" symbol appeared to be heading for a double-digit decline, but recovered some ground on the last day of the month, as management announced a $500 million share buyback plan that is likely to be executed in rapid fashion. Monster recorded gross margin of 60.6% during the first quarter, versus 64.8% during the prior-year quarter. Even after adding back a $9.9 million impact due to a new accounting standard (Accounting Standards Codification, or ASC, No. 606, which reclassifies commissions as a reduction in net sales), adjusted gross margin of roughly 61% still represents a decline of nearly 4 percentage points. It also marks a single-percentage-point dip against the previous sequential quarter (fourth quarter of 2017). "certain increases in other costs"
Sacks' list is problematic for Wall Street analysts as the sheer number of specific factors exerting downward pressure makes forward modeling of gross margin difficult. And for the average retail investor, the reasons presented make clear that numerous forces may potentially buffet profit over the next few quarters. ...[I]t is important to bear in mind what's happening with aluminum, which can fluctuate significantly even within a day. The Midwest premium freight, fuel issues, promotional allowances, geographic sales mix, domestic product sales mix, continuing investments in China and India, and so it's extremely difficult to talk about a sustainable gross profit margin percentage when there are many noncontrollable factors. So we really are not in a position to give any further guidance on gross margins. Note the introduction of still more factors depressing gross profitability. Schlosberg was also asked if the company would raise beverage prices in the U.S., as it had done in similar past cycles. He responded by asserting that management continuously reviews pricing regardless of margin pressures, and declined to signal if Monster would soon nudge prices to offset rising costs. As you might have gathered, shareholders are unsettled by the external, or "noncontrollable" aspect of so many disparate factors. Rising aluminum costs exacerbated by the Trump administration's tariffs on imported steel and aluminum, commodity inflation in the form of higher sugar costs, and rising shipping costs due to tight supply in the freight industry, all strike me as palpable external profit threats. And frankly, Monster's reluctance to provide an expectation of a time frame around margin weakness has also informed investors' near-term cautiousness following the first-quarter earnings report issuance. Longer-term, management discussed several margin improvements that Monster should eventually realize. CEO Sacks explained that as the organization continues to enter new global markets through Coca-Cola's (NYSE:KO) distribution system, and partners with Coke's bottlers, it can gradually shift production within geographic regions to local manufacturing, saving freight and import costs. Sacks also observed that the company's "strategic brands" segment, which includes carbonated energy drinks such as Burn, Gladiator, Full Throttle, and NOS, is primarily a concentrate-based business, with manufacturing provided by Coca-Cola. While Coca-Cola has divested its bottling operations to local partners around the globe, it still produces its own concentrates, as well as those of Monster, its equity investee. Growth in strategic brands will improve overall margin, as gross profit is generally higher in concentrates versus bottled products. Finally, Monster intends to shift its coffee-based energy drink Espresso Monster, currently manufactured in Europe, to local production for U.S. domestic consumption, raising the beverage's margin profile. The previous details are helpful in understanding the larger opportunity around future production efficiencies. But they don't completely resolve concerns. Even committed long-term investors are unlikely to ignore the margin caution flags raised on this last earnings report: Stakeholders won't completely relax until the current margin trend stabilizes.